Whoohoo! Another finished quilt is in the books! We named this pattern “Lottie’s Squares” after my great-grandmother. Lottie made lots of quilts using this block. We created ours in blue and white – because who doesn’t love blue and white? Such classic colors. 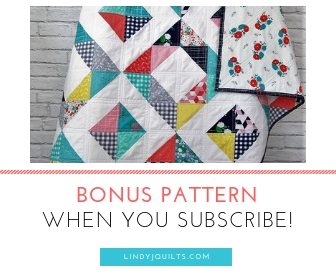 I’m not going to lie – this quilt was a doozy to put together! Unfortunately our Accuquilt Go! 3 ½” square die didn’t give us perfect squares – something we found out AFTER we had all of the 143 squares cut out and when we started piecing them with the white borders. Most of the squares came out almost 1/8” short on one side. That doesn’t sound like much, but in the quilting world, once your cuts go wonky, your quilt goes wonky. So it was back to the cutting board. We essentially re-cut by hand all of the squares because there’s just no way to fudge a non-square block. And as much as we thought we loved our AccuQuilt, it was good for us to get in some rotary cutting practice and gain some confidence in our own cutting skills. Good thing Mom and I are persistent and don’t give up! We are such a good team! We lined 2 sides of the 3 ½” square with 1 ½” white strips to create 4” blocks. We then laid the blocks out in an alternating fashion that made us go cross-eyed more than once. The extra quilting really made a difference on this pattern. We started with just quilting in the seam ditches. We then put the quilt on the floor and agreed that the quilt needed something more to break up the pattern and really emphasize those pretty blues. We decided to add 1” extra quilting lines on either side of the ditches and wow! What a difference! The back of this quilt is so adorable – we used the blue and white crab fabric from Timeless Treasures to keep the playful vibe going with this quilt. And to finish it off, we used a beautiful simple royal blue binding to frame it all up. Such a cheerful, sweet and modern quilt. It’s a little bit bigger than some of our quilts measuring at 44” x 56”, so it will be an awesome play mat, picnic blanket, toddler quilt, lap quilt, etc. etc. We use a low loft batting, so the quilt is comfortable without being too heavy. Maybe it’s because we live in the South, but we like our quilts to be light and bright. So a lot of lessons learned this week. But we still had fun putting this one together – we’re thinking of trying a larger square for our next modern log cabin. We’ll put that in our pipeline of project ideas for the future! Thanks for stopping by – we hope you’re having a wonderful week! P.S. Stay tuned – we have a finished orange and blue patchwork Florida quilt coming soon and a bunch of new quilt projects. We can’t wait to share those with you! The finished quilt turned our great! I love it! The clear blues and pure whites, so clean and contrasting and then the alternating pattern is a great combination of crisp and, well, can I say it? kind of chaos! Such a modern look and you’re right, the quilting really makes it pop. Beautiful!